Just as better ideas and more efficient strategies replace older and outdated ones in business and industry, the world of sports is also constantly evolving. Sluggers eating five hotdogs before the game and power forwards taking smoke breaks at halftime have been replaced by athletes who work out seven days a week and have single digit body fat percentages. To stay ahead of the competition, today’s athletes are unrivaled in terms of physical preparedness and ability. Unfortunately, faster and stronger athletes create a greater potential for injury on the field. The increased power and speed seen at every level of modern athletics makes proper safety equipment and padding incredibly vital. The leather football helmets and low-top canvas sneakers of yesteryear are no longer enough protection against the forces and impacts experienced in competition. The Foam Factory understands this and is proud to offer a broad selection of protective athletic foam padding options to keep people safer. The Foam Factory’s manufacturing capabilities allow them to specialize in foam-only custom pads and inserts. Replacement components can be made for athletic equipment, as can new, custom forms to meet the specific needs of an individual. People who are uncomfortable in their equipment tend to wear it improperly or simply refuse to wear it at all. Both of these situations can cause injuries, so The Foam Factory also manufactures comfort padding inserts for existing products to save people the money of having to buy replacement equipment. In addition to padding the individual athlete, gymnastic rubber mats are also available for padding entire areas for exercise or practice. Closed-cell foam’s density, moisture-resistant characteristics and resiliency against force make it an excellent material for use in helmet padding, forearm, elbow and knee padding, chinstraps and shin guards. For padding applications, The Foam Factory uses closed-cell foams neoprene, polyethylene, cross-linked polyethylene (XLPE) and polyethylene foam roll for their strength and shock absorbing qualities. They are capable of diffusing the impact of hits and falls without degrading and are impervious to moisture, bacteria and mildew, so they will not weigh down equipment with sweat or cause odor. 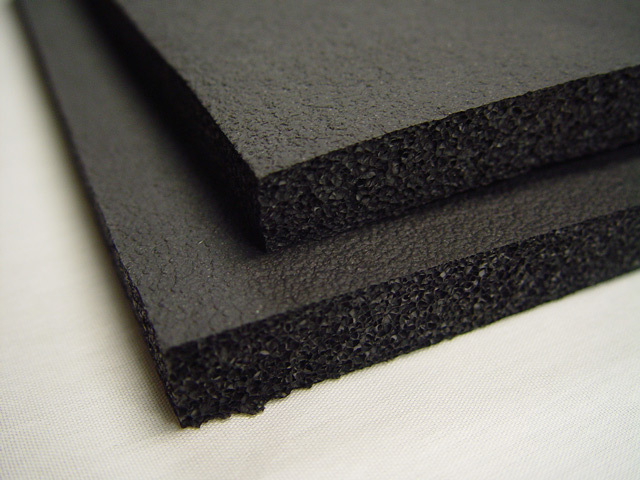 Gymnastic rubber matting is another closed-cell foam that excels as padding. Used on floors for dojos, gymnastics and wrestling, it can also be applied to walls that are very close to areas of activity for additional safety. To reduce uncomfortable rubbing or pinching from on-the-body equipment like shoulder pads, knee pads or catcher’s equipment, comfort padding can be added to reduce irritation. Other impact-absorbing comfort products The Foam Factory is able to manufacture include foam inserts in base-layer compression apparel frequently worn by basketball and football players, custom insoles for in-line or hockey skates and even padding around insulin pumps worn during competition. To apply these foam-only replacements or inserts to your equipment, The Foam Factory also stocks spray adhesives that can be used to bond materials to a shell at home. Instead of sending your equipment away for a simple modification, doing it at home can get you back in the game much more quickly. It is also more economical to repair or replace single components of otherwise sound equipment, rather than purchasing an entire new product. With their computer-programmed machinery, The Foam Factory can produce a single piece of athletic padding or cushioning affordably, eliminating the lead time needed to manufacture stamping dies. That die-cutting machinery however, can produce very large numbers of identical products economically for bulk orders. Whether coach is sending you to bat in the bottom of the 9th or you’re meeting friends for a game of Horse, The Foam Factory can help provide peace of mind that you’ll be able to enjoy yourself safely.